Carteret County is a coastal county, part of the Crystal Coast. The county seat is Beaufort. Carteret is the strongest Republican county in eastern North Carolina. This is due not only to the affluence of many of those who own beach property, but because the county is overwhelmingly white. Carteret is extremely hostile to Democratic candidates, Mitt Romney almost hit 70% here last year and carried all but two precincts. 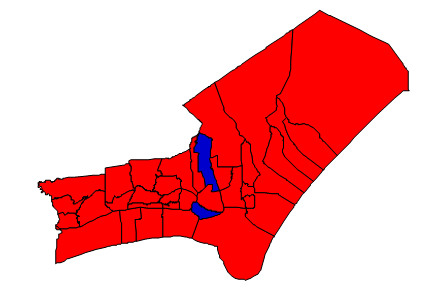 For the presidency, Carteret last went Democrat in 1976, going for Southerner Jimmy Carter. The county achieved notoriety during the 2004 race for Agricultural Commissioner, when a voting malfunction caused the loss of 4,438 votes. A recount election was held, leading to the election of Republican Steve Troxler as Agricultural Commissioner. Forecast: Carteret has been trending Republican since 1992. The Republican trend is accounted for by two factors: native white voters abandoning their Democratic roots and an influx of affluent voters who want to enjoy beachfront property. Carteret, however, has not experienced the rapid growth of other coastal counties, so the first factor is important. Republicans are buoyed here by the lack of minority voters: the county is 90% white, whites compose an even higher percentage of registered voters, and the 2000s decade actually saw a decrease in the number of black residents. Carteret County is politically what eastern North Carolina would look like if all the black residents were not voting. The county grew by 11.93% from 2000 to 2010, about average. Population estimates from 2012 show greatly reduced growth. Carteret County should remain solid Republican.